On 23–25 June 2015, UNU-IAS co-organized the Second Conference for East Asia Research Association for Agricultural Heritage Systems (ERAHS) in Sado City, Japan. Over 150 participants participated in this conference on traditional agricultural systems, including researchers and academics from China, the Republic of Korea, Japan and the Philippines, as well as local policymakers and municipal government officials. The participants discussed scientific research and best practices in the conservation of agricultural heritage systems in East Asia. Dr. Charles M. Boliko, Director of the Food and Agriculture Organization’s (FAO) Liaison Office in Japan, spoke on the importance of FAO’s Globally Important Agricultural Heritage Systems (GIAHS) – traditional land use systems and landscapes recognized by the FAO – emphasizing the significance of traditional agricultural systems in sustainable development. On the same note, Senior Vice-Rector of UNU Prof. Kazuhiko Takeuchi commented on the important role agriculture plays in meeting the new Sustainable Development Goals (SDGs), stating that “the ‘coexistence’ concept of nature shared by East Asian countries can further promote sustainable development of agriculture”. UNU-IAS Research Associate Evonne Yiu presented on the outcomes of the UNU-IAS project Developing a Comprehensive Assessment Method for Ingenious “Agri-Cultural” Systems in Japan (ACS), which included developing assessment criteria for Japanese GIAHS candidate sites and contributing to the establishment of ERAHS. In the panel session on “Traditional Agriculture in Marginal Areas”, UNU-IAS Senior Programme Coordinator Akira Nagata compared cases from China, Korea and Japan. Conference attendants also participated in a one-day field excursion. They visited Futami Peninsula, the rice terraces of Ogura Senmaida and the modern industrial heritage site for Sado gold and silver mines, and also watched a takigi noh theatrical play. 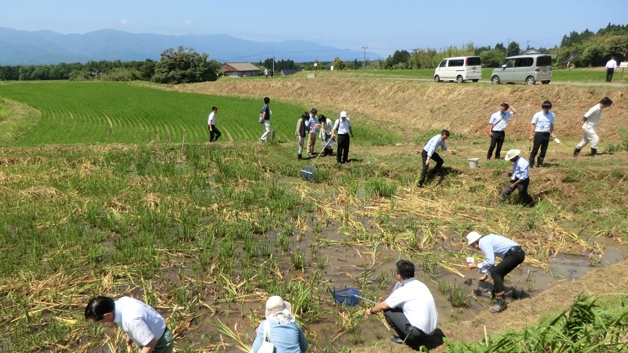 The excursion also included a biodiversity survey of paddies that produce rice certified as environmentally friendly to Japanese crested ibis. During the survey, the participants had the good fortune to chance upon wild crested ibis. The conference ended with a working meeting on the last day where it was agreed that the third conference would take place in Guemsan, Korea in June 2016. For more details on the 2nd ERAHS conference, please contact Ms. Evonne Yiu at yiu@unu.edu.